I am an athlete, among my many other talents. I have skated on inline skates 21,000 miles and yes I have counted them being one of those rigid people who only skated on measured courses. I used to be a runner. I would run 10K 3 times a week at Valley Forge National Park. I'd power myself up and down hills on the trail there and faithfully be out running into the winter cold or the summer heat. I guess it comes with the territory, I have some creaky knees. Being 6'4" tall, I've been told you will have some joint issues. I have been taking Glucosamine for years, and when my dog had her last stroke they put her on the stuff because she's going to be 11 in November. Some say it does not work. I insist it does. My last injury caused my one knee to lock up with pain and I had troubles walking. So I got on the Glucosamine at 1000MG per meal and the pain slowly went away. My dog got much more moblie after being on it and I suggested it to someone here who has a very old dog who now has much more energy. Your Mileage May Vary. It May Not Work For You. The article in the link above suggests it works, it also suggests that it doesn't work. When I saw a 14 year old tumor laden Black Lab dog go from barely being able to move to almost puppy like energy, I was sold. Actually I was sold a long time ago so I'll keep on taking it. On the other hand, while I am subject to the placebo effect, my dog is not. So I keep the stuff on hand and pop two tablets with each meal and Lettie thinks they're treats because they're sweet. I got low on them and ordered a couple month supply from a website and thought nothing of it. Later I ran across a "Good Deal" at Tanga.com for the glucosamine. It was $11 a bottle and for the dosage I was taking I thought it would be nice to try it. After all I was saving a few dollars on something I will use. The delivery was a bit slow, I thought, and just when I began to get concerned I got a curious email. You see, Tanga got overstocked. For each bottle ordered they were shipping a case. I read that three or more times and thought, I ordered four bottles! Four times 24 is 96! They can't be serious! They were. I got two cases on Wednesday and hoped that would be the end of it. After all it goes bad in December 2012 so I could use a good share of it and maybe give some to some folks. A chance to do a good deed again for some folks not so well off. Yesterday I got another two cases. I even said to the Fed-EX driver "I wonder what my partner ordered?". No, it was my name on the rather heavy box and I was confused. The driver got back in the truck after picking up the two boxes of someone else's treasures that had spilled out onto the grey asphalt and sped off. Puncturing the box I got into the packing material and found ... The Other Two Cases of Glucosamine! Yes, I have a bounty of the stuff. 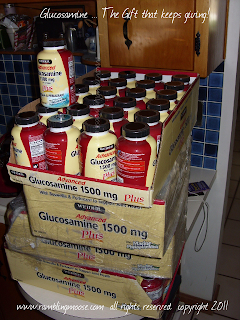 I've given some to my neighbor across the street and have some more earmarked for some folks with joint problems that could use it but I now have a tower of Glucosamine in my kitchen. I'm amused. I seem to have gotten the jackpot here. I've figured out that every so often Tanga.com does this sort of thing, they ship out overstocks and you get a lot of what you ordered instead of one. It's actually a pleasant surprise, and I'll find homes for the extras, after all if I use one whole case of the stuff it will be a lot. Most of it has already been earmarked. So if you see me bouncing along, the glucosamine is working! I'm still checking tanga.com for their daily deals, and sometimes they have some good ones. If you're looking for a good Deal A Day site, I recommend them highly. After all you may get a bounty of glucosamine yourself!